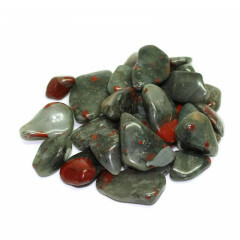 This stone is an interesting mineral conglomeration, usually comprised of green Jasper with red Hematite inclusions, which form a pattern which can look like blood spots. 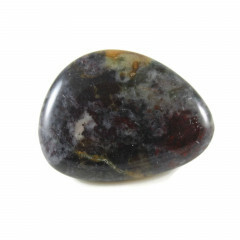 This stone is a variety of jasper, or chalcedony – usually green Jasper with red Hematite inclusions, for the classic look. It is generally known as ‘Heliotrope’, in a mineralogical sense – but this name is used less often in a jewellery / crystal healing sense. 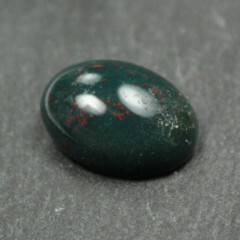 It is the traditional birthstone for March. Most of the worlds supply is mined in India, but the stone is found in a range of places, including China, Australia, the USA, Brazil and Bulgaria. Heliotrope was called the ‘stone of Babylon’ by Albert the Great, who referred to it as having several magical properties. Pliny the Elder claimed that it was used by magicians as a stone of invisibility. It has been mentioned by several other prominent historical sources as possessing magical powers or abilities – the Wikipedia entry has a few examples. Historically it was thought to aid with summoning rain, or finding water. It may have been used for dowsing for water in the past. It is thought to be particularly effective for healing or helping with problems with the blood, purifying the blood and aiding the immune system, and is thought to be especially helpful with the blood organs, like the heart and kidneys. It should be aligned with the Base chakra or the Heart chakra.